Triumph have developed an all-new Daytona using the 765 engine first debuted in their Street Triple, an evolution of which will be used in Moto2 from this season onwards. While speculation has been rife that the Moto2 project would pave the way for the return of the Daytona, these pictures are the first proof that Triumph does have a road bike waiting in the wings. There’s no doubt that this is a new model, but there’s also no hiding the fact that numerous parts appear unchanged from the Daytona 675. Much of the frame and swingarm look absolutely identical, while the shape and contouring of all the fairing panels is so close as to be virtually indistinguishable from the old model. It does boast a new single-seat tail unit that has no scope for pillion duties, while the bright red subframe, a historical indicator of it being an R model, almost certainly retains the hidden pillion mounts that would be necessary for a base or S model. Despite much of the bike being Daytona-familiar, the engine is very clearly the 765 unit from the Street Triple, although it’s probable Triumph will have breathed on it with learnings taken from their Moto2 development programme. While the Moto2 engine shares most of the same architecture as the road engine, there’s little doubt that key changes to the valve train, cam profiles and the weight of key internals will be lessons that could pay dividends in a new Daytona. Amidst a sea of black fairings, the gold highlights of the Öhlins fork and shock are jewel-like highlights. The fork appears to be a high-spec fully adjustable NIX30 unit, from which hang Brembo’s very latest Stylema radial calipers – which are lighter and offer more power and better thermal properties than previous versions. Meanwhile, the TTX rear shock appears to be identical to the unit previously used on the R model Daytona 675 – with its piggyback reservoir and large black and gold compression and rebound adjusters. Flashy as they are, they’re clearly mechanical units, so don’t hold your breath for semi-active suspension hardware. Also visible nestling beneath the screen is Triumph’s high-def TFT full-colour dash, and the associated switchgear – complete with ‘joystick’ controller. This means we can expect multiple dash options for road and track layouts, as well as high and low contrast versions of each. It also means we’ll see multiple rider modes, likely to include Road, Sport and Track settings, along with a Rain mode and a User setting for tailored fiddling. 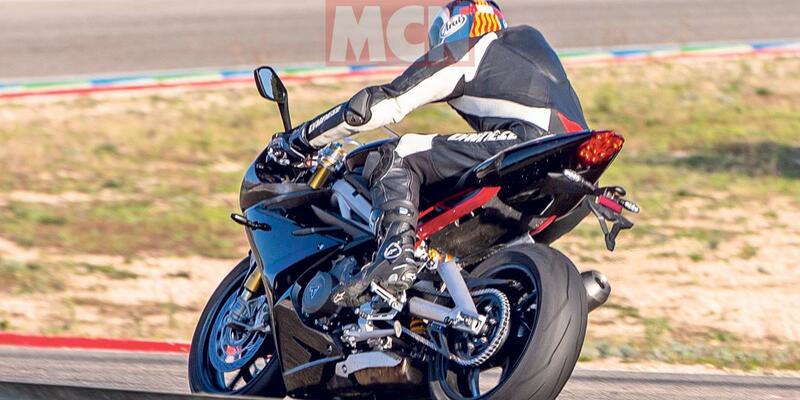 We’d also expect a full six-axis IMU to be driving the systems, meaning Cornering ABS and even slide control could be possible as part of the traction control system – with a bi-directional quickshifter also likely for such a track-focussed bike. 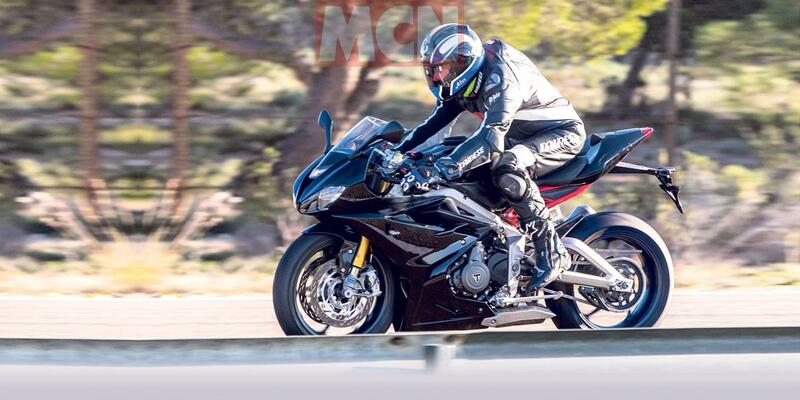 So when will the Triumph Daytona 765 arrive? Triumph remain resolutely tight-lipped about this bike even existing, so there’s currently no confirmation available about when it might arrive, or how much it might cost. But with Moto2 kicking off on March 10 in Qatar, it would seem like a good time to admit the Daytona’s existence, while we wouldn’t expect a production model to arrive until late 2019 at the earliest.